Most people don't know that a dairy cow can only produce milk if she is forcibly impregnated. When her calf is born he is killed leaving the mother grieving for her babies death. She is then re-impregnated 6-9 weeks later. This cycle continues until she can no longer produce enough milk to be considered profitable. The mother too is then killed. 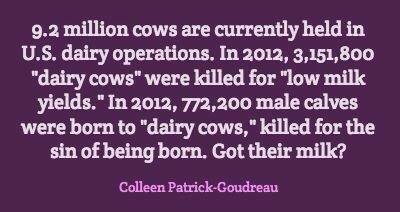 Over 80,000 calves are slaughtered every year in California, the nation's largest dairy state. In this video, Farm Sanctuary investigates the dairy industry. "A seemingly innocent trip to the grocery store shows this cartoon man the whole #milktruth. The reality is that cows produce milk for the same reason that humans do: to nourish their young. In order to force them to produce milk continuously, factory-farm operators typically have the cows impregnated by artificial insemination every year. Calves are generally torn away from their loving mothers within a day of being born, which is extremely traumatizing to both mother and calf. Male calves are destined for cramped veal crates or barren lots where they will be fattened for beef, and females are sentenced to the same sad fate as their mothers. After their calves are taken away from them, mother cows are hooked up, several times a day, to milking machines. 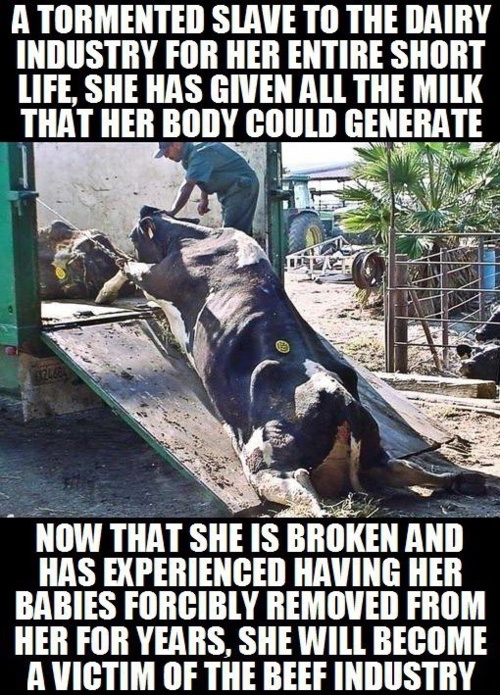 They are genetically manipulated, artificially inseminated, and often drugged in order to force them to produce about four and a half times as much milk as they naturally would for their calves. A cow's natural lifespan is about 25 years, but cows used by the dairy industry are killed after only four or five years. Because the industry manipulates them so intensively to increase their milk production, they are considered "spent" by then, and their bodies are turned into soup, companion-animal food, or low-grade hamburger meat." "A cow’s natural lifespan is about 25 years, but cows used by the dairy industry are killed after only four or five years. An industry study reports that by the time they are killed, nearly 40 percent of dairy cows are lame because of the intensive confinement, the filth, and the strain of being almost constantly pregnant and giving milk." Click Here for the article and 60 second video. What we see here on this Whole Foods 365 Organic milk carton is a happy, healthy-looking cow, beautiful blue sky and puffy white clouds — an idyllic Old McDonald farm scene. But the gulf between this facade and the reality behind it could not be greater in this case.